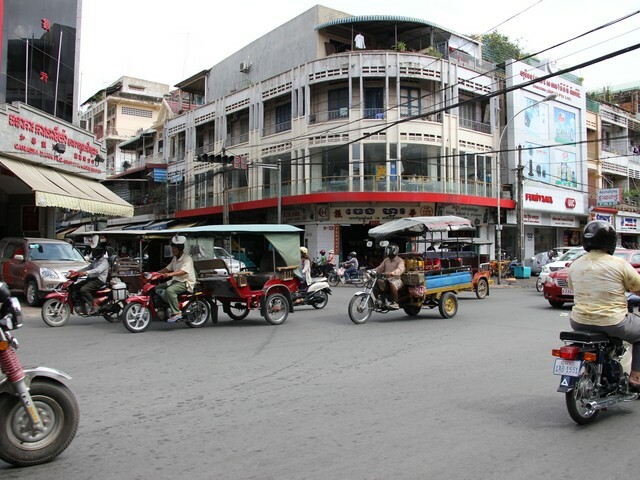 ‘Tuk-tuk?’, a toothless middle-aged guy beamed at me the moment I stepped out of the guesthouse. I smiled back and told him I was just going to the corner to get cigarettes. Thanking them again I explained that I didn’t really need a driver for the fifteen-second journey to the guesthouse I’d emerged from moments earlier. ‘Tuk-tuk? Tuk-tuk?’. Reaching the entrance I threw up my hands in mock exasperation and they all roared with laughter. A young couple walked out into the street and they all started up again. ‘Tuk-tuk’? I pondered this business strategy from the rooftop bar, wondering if there was any method to the madness and concluded that they would eventually wear me down. 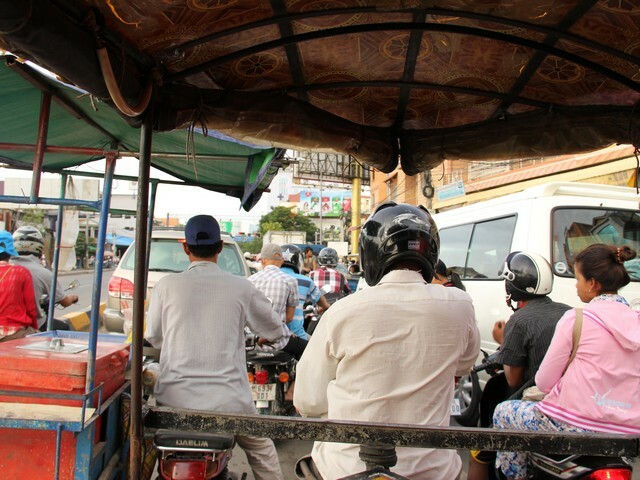 I envisaged taking a spontaneous ride to nowhere in particular, on condition that the driver didn’t yell ‘tuk-tuk’ at me every three seconds. The next morning I was greeted again by sunshine, humidity and ubiquitous urban birdsong. ‘Tuk-tuk? Tuk-tuk?’ I lowered my head in defeat, and they knew they had me. My thin toothless friend grinned. ‘You go Tuol Sleng? Choeung Ek?’, he beamed in a manner I found disconcerting, though not for his lack of dental work. I was off to visit two of the most arguably soul-crushing places on Earth. My driver and guide was thrilled to have secured a few hours of work. 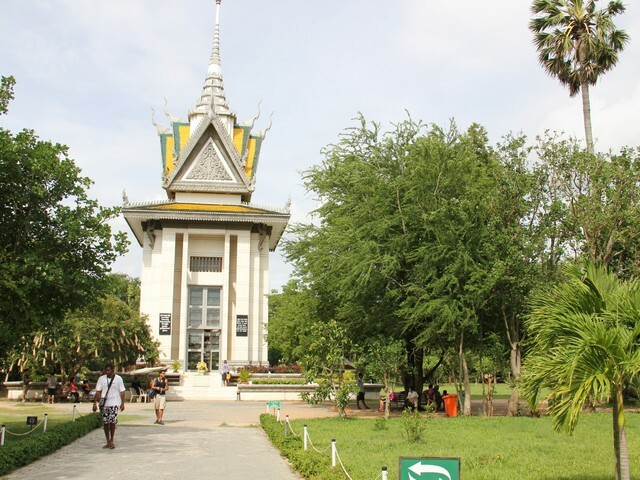 Phnom Penh’s premiere tourist attraction (according to Trip Advisor) is the highly disturbing Choeung Ek Genocidal Center (the Killing Fields). 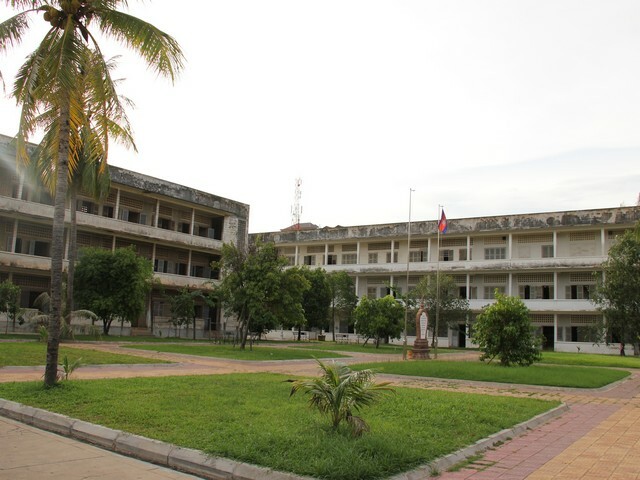 This is generally visited after a harrowing tour of the Tuol Sleng Genocide Museum (Security Prison 21). This is not a lighthearted day out. It didn’t take long to arrive at a rather peaceful looking complex that resembled a high school, which is what it had originally been. The driver told me to take my time and that he’d be waiting outside. A failed scholar from a family of relative privilege, Saloth Sar returned to his homeland from France in 1953, having been attracted to the anti-colonialist ideals of French Marxist groups. By 1975 (aged 50), Saloth Sar was leader of the Communist Party, the Khmer Rouge took control of Phnom Penh, and Sar became de-facto leader of the country. He gave himself the title “Brother Number One”, afforded himself the nom de guerre “Pol Pot”, and set about creating an agrarian socialist utopia. Apparently some Cambodians didn’t really want to live in an agrarian socialist utopia, most notably those from the cities who had, on average, attained higher levels of education and wealth. Pol Pot decided to fix that by evacuating the cities. Many remained concerned however that this was less than ideal, so Pol Pot decided to fix that by having them all killed. Of course, not all of those who died were murdered. Countless numbers died of overwork, starvation and disease… and those who somehow managed to stay alive and deemed in opposition to the regime were murdered. By the end of the 1970’s an estimated 2 million people had fallen to the Pol Pot’s regime – approximately a quarter of all Cambodians. How was one deemed to be in opposition to to the regime? Well… if you were a doctor, teacher, engineer (or educated), or a soldier of any rank, a Buddhist monk, one of Pol Pot’s own cadres, or if you wore glasses (an indication of intelligence)… or, if you were the wife, husband or child of anyone fitting such a description… you were pretty much fucked. It was these kinds of traitors who were taken to places such as S-21, a short-term prison where around 17,000 people were kept for a few months, tortured horrifically to confess to whatever they had been arrested for, and give the names of family members, who would then also be arrested, sent to prison, tortured and so on… it is believed that only seven people survived S-21. 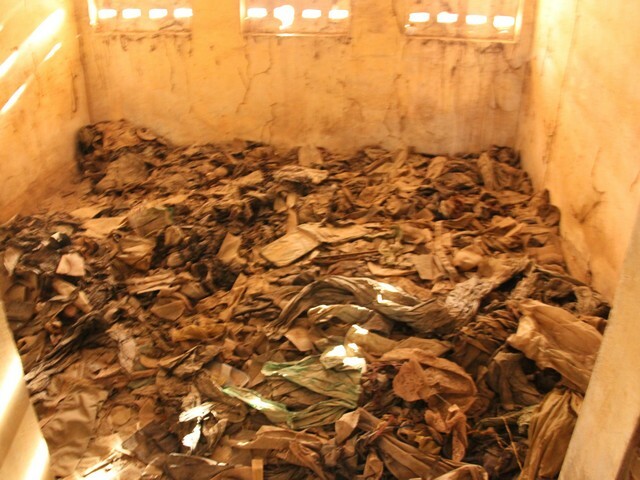 Undisturbed for decades, clothes and belongings of inmates of S-21. Difficult to comprehend, and to stomach. It was not here however where most met their fate. 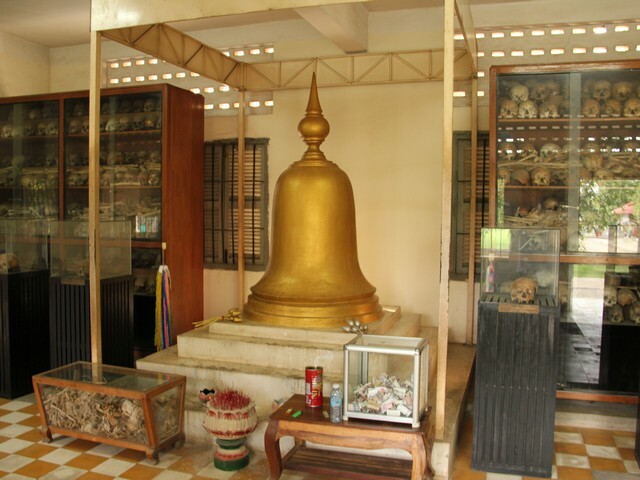 After a couple of months shackled to the wall or floor, inmates were loaded onto trucks and driven about 15 kilometers out of the city to Choeung Ek, better known to many as the Killing Fields. 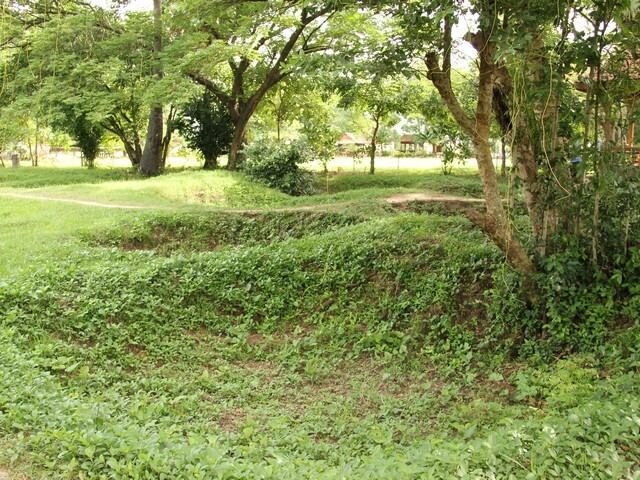 Here and at numerous other locations around the country, the prisoners were unloaded, brutally murdered with iron bars, machetes or whatever was handy (bullets were scarce, and considered too expensive to be wasted), then dumped unceremoniously into mass graves they had been ordered to dig themselves. Many were simply buried alive. Exiting the Genocide Museum I climbed quietly into the tuk-tuk and we set off for the Genocide Center. My driver was less chatty now and left me to my thoughts. The potholed road left the city behind and it was almost relieving to have my thoughts distracted by the stench of the open sewer running next to the road… almost. 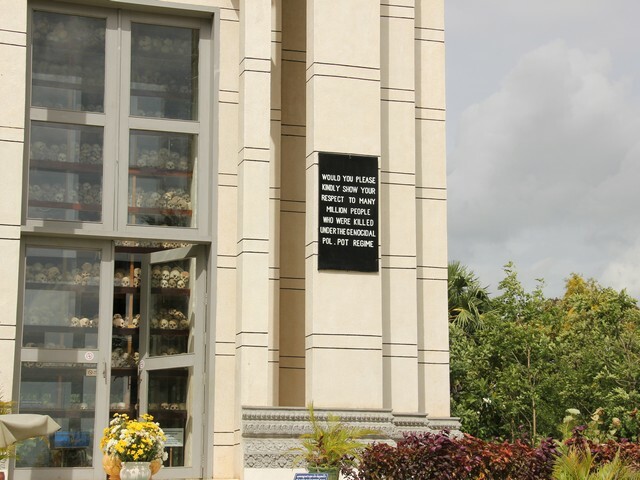 We arrived at the Killing Fields, where my guide again told me to take my time, and that he’d be waiting outside. 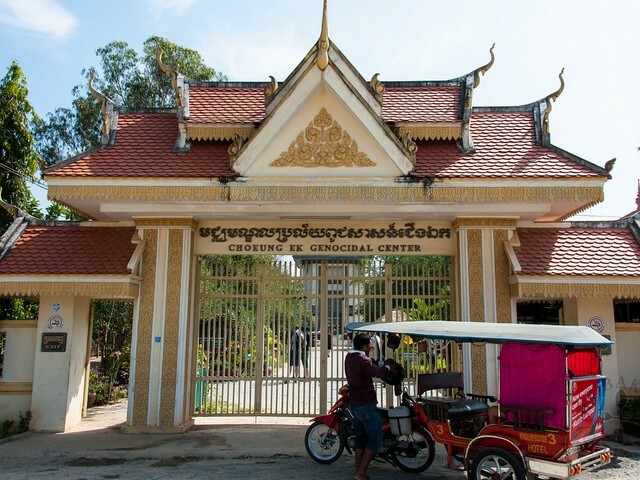 Entrance to Choeung Ek Genocidal Center. Perhaps the most effortlessly surreal place I’ve ever seen, the ‘Killing Fields’ looks, at first glance, like the kind of well-maintained public park suitable for a lazy Sunday afternoon picnic. Calm, green, and very quiet… and offering constant reminders of brutality and death on an almost inconceivable scale. The centerpiece stands directly ahead of the entrance – an impressive Buddhist Stupa commemorating the millions of innocent lives lost during the four-year genocide. Only up close I realised that the monument is actually the resting place of over 8,000 anonymous Cambodians lost in the insanity. Many of the skulls are broken or smashed. Like everyone else I walked slowly and in silence, listening to my rented headset explaining the various sites. I felt a sudden little shudder of guilt after momentarily forgetting where I was and thinking, after the semi-organised chaos of Phnom Penh, that this tranquil green garden was such a peaceful place for a walk. It reminded me of a golf course, except the sand traps, devoid of sand, were actually excavated mass graves. Tranquil and sickening. The Killing Fields. 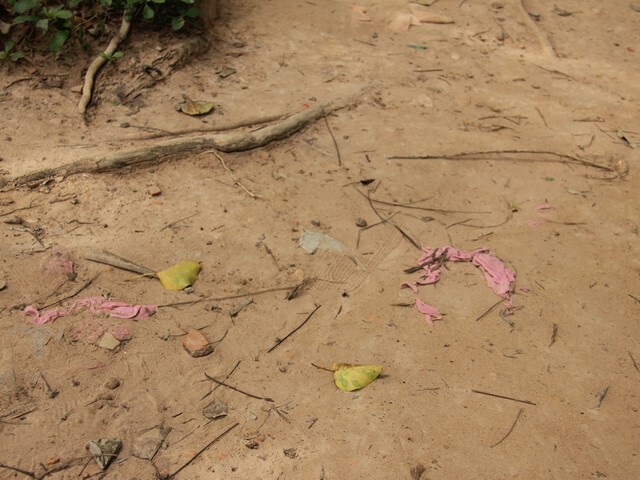 I walked over bone fragments and small scraps of clothing embedded in the dirt, which continue to surface each year during the rainy season. Past the “Killing Tree”, against which children and babies were bludgeoned to death (to ensure they wouldn’t return as adults seeking revenge). Past numerous excavated mass graves, and signs respectfully requesting that I not touch… anything. I trudged out of there exhausted. The tuk-tuk driver was waiting, smiling broadly. I couldn’t fathom quite how. Statistically speaking, as a young man he lost a quarter of his family and friends, and a quarter of the people he’d ever met… they were exterminated by fellow countrymen. He asked me, without a trace of irony, if I’d like to go to a tourist-trap nearby and fire an AK-47, explaining happily that foreign tourists like to shoot stuff. I figured he’d get a small kickback for every tourist he took there, and couldn’t figure how anyone in their wrong mind would want to shoot at anything after visiting the places I’d just seen. I told him I really didn’t want to shoot anything. He laughed and told me that I could explode a cow with a rocket launcher, but I would have to pay. In the face of endemic oppression, corruption and poverty, I guess there’s little room for sentiment. 4 Comments on "Tourism in Cambodia: Genocide and Broad Smiles"
These was really a heart breaking stories. There was no tranquility for their souls. Large scale of people who was murdered was still searching for justice but how? Perhaps only a silent prayers for their souls and a candle lighting will be given for their spirits to rest in peace. Cheers Krunk. Yeah, ’tis the wild wild east. The Seoul Subway System… the World’s Best?